Stoically, I wait on for the upcoming bird-dog season and the aspen auxins to change the leaves from the green to golds of the Colorado blue grouse country…the caddis are hatching on my home waters seducing recluse big-browns to the surface. Before long, I’ll be in the Colorado high country hunting greenback cutthroats with mayflies, yellow sallies, and terrestrials and conditioning my bird dogs at 11,000 ft for the uplands that Idaho and Kansas has to offer. A wise man once told me that some of the very best bird-doggin’ he does in-between the seasons is in upland sporting literature and day dreaming. Paul (who’s my favorite bird-dog book broker), you are so right on! 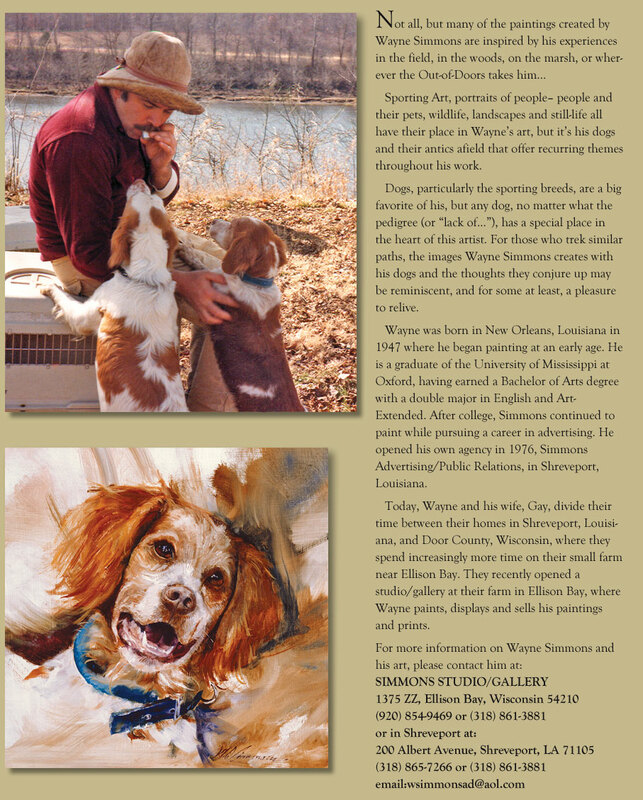 I just finished reading a delightful book by artist turned author Wayne Simmons about his brittany-bird-dog Jules Verne. The Story of Jules Verne: A Watch Pocket Dog is destined to be a classic among sporting dog and brittany affectionados! Wayne weaves a great yarn about the triumphs and tribulations of Jules which had me hysterically chuckling and Karen (again) questioning my sanity…she already thinks I’m a bird-brain! The best compliment one can give an author is to beg for a sequel! I hope Wayne will consider…PLEASE! PLEASE! Visit Wayne’s website to see his impressive art work and order his book for your own collection! This is how to spend a life–chasing bird dogs. You and Simmons are peas in a pod. You oughta’ write The Chronicles of Ellie, The Crazy Cocker Spaniel! Doc – The snakes seem to be waking as winter fades away. Curious to get your thoughts on the rattlesnake vaccine. Is it worth doing? Are there any other precautions (other than hunting in the winter) that you take to protect your dogs?